The game is played on metallic pitch, with powerups dotted everywhere. 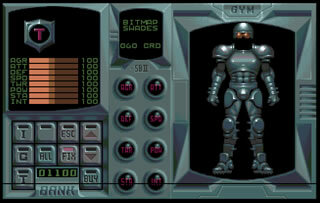 Speedball 2: Brutal Deluxe was an ultra violent sports sim released by legendary developers The Bitmap Brothers in 1990. It pit two teams of armoured players against each other in a no holds barred battle for points. The game featured great graphics and sound for the time and some beautifully designed game-play which was deeply addictive. 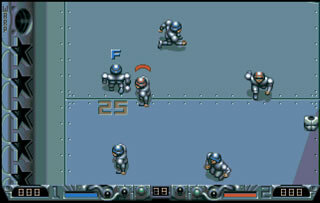 The original Speedball was released in 1988 for the Amiga and the sequel two years later expanded brilliantly on the first game upping the team sizes to nine and introducing new methods for scoring. The basic idea was a strange mixture of handball and ice hockey which bore more than a passing resemblance to the cheesy 1975 movie Rollerball. Speedball 2 was set in 2105 in a shady underground league and players were charged with leading a new team called Brutal Deluxe to success. There were several ways to score, throw the ball into your opponent’s goal, bounce the ball off various targets around the arena or mash your opponent into the ground and injure them to the point where they had to be stretchered off the field of play. You could also supercharge the ball to send it hurtling through opponents and use the multipliers to up your scoring tally and the game featured a variety of pick-ups littered around the arena. In addition to power-ups you also had to collect coins so you could beef up your players between games or purchase new ones. As if all that wasn’t enough each arena also featured teleport points which you could throw the ball through for crafty passes to bypass the other team. The main single player game featured extremely challenging AI opponents and fighting your way to the top of the two-tier league was not an easy prospect. You could also play against another human opponent and I have many happy memories of battering friends into submission on my way to scoring a goal. Although there was always an argument about who played with the keyboard and who got the joystick. The game had a pretty steep learning curve and involved serious button mashing often leaving you with an aching hand. The camera would zoom in on the portion of the court where the ball was and control automatically jumped to your team member nearest the action. Each game lasted three adrenaline fuelled minutes, two halves of ninety seconds. In addition to the two tier league there were knock out cup competitions and an in depth management system which allowed you to upgrade or transfer players and bring in the top stars. In order to afford better players you had to make sure to collect coins during the games and the necessity to focus on this could often cost you valuable points during a match, particularly early on when your team was weak. The 2D graphics were great, matches had a top down view and players had a small range of animations which were easily enough to bring the concept to life. In between rounds the player transfer system featured portraits of a fantastic motley crew of hardened pros mostly sporting eye patches and scars. The music in the game was also memorable and actually won the Golden Joystick award for best soundtrack. The sound effects were meagre but effective and few were more joy inducing than the siren which accompanied the medical guys running on with a stretcher to carry off your mangled opponent. Speedball 2 was a hugely successful title and while it was originally released on the Amiga there were also versions for the Atari ST, the Commodore 64, the Sega Mega Drive, the NES, the PC and the Game Boy. It is fondly remembered by gamers of a certain age but those unfamiliar with it can play a fairly faithful version on the Xbox 360 via the Xbox Live Arcade. This is one of my all time favourite games although it is often criticised for being a button masher. The things is, it had the perfect blend of pick up and play accessibility and tactical depth. Newcomers could get instant results by frantically pounding the joystick or keyboard but veterans soon developed more complex tactics for victory utilising the multipliers and teleports to devastating effect. Whatever your skill level it offered a frenetic blast of clever game-play and it deserves its place as a revered classic. I got this a couple of days ago. I used to play it on PC on 1994 or something . Still the same amount of fun. Though it turns out i got better over the years. Never managed to win the league back then now I won after 2 tries 😀 . This is an excellent review of a truly all time classic game. The playability of it still stands up today – for a single player or for two. Utter brilliance from the Bitmap Brothers – Speedball 2 is a timeless game.